Somewhere in mid January, I always gear down my approach. There is no need for using big lures now to trigger any strikes. The big feast is over. All that remains for the Pike, is just the survival through the Winter on the reserves they made in Fall. 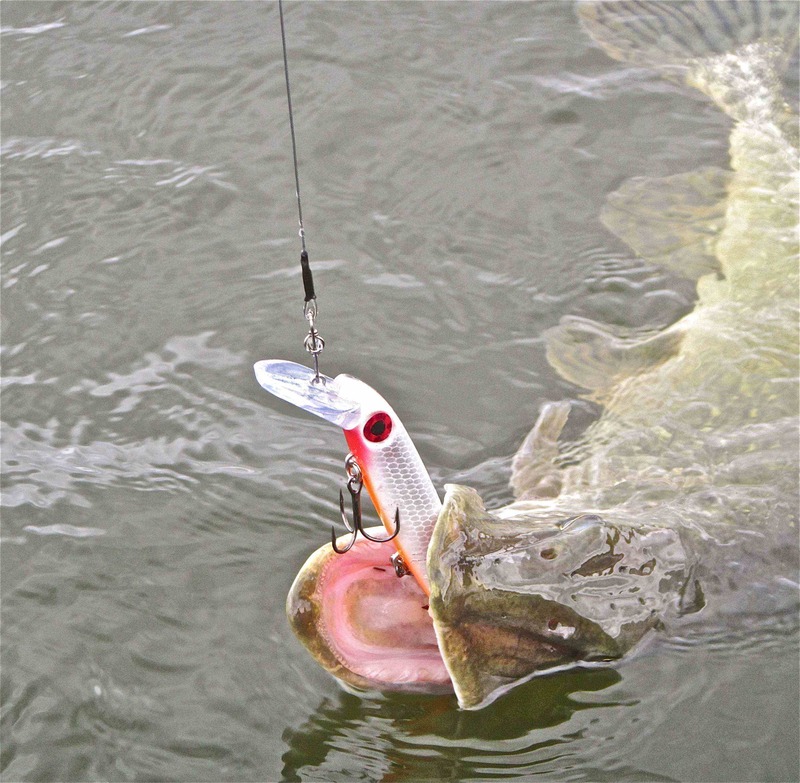 If they are hitting lures this time of year, it’s all about agression, and speed is key. Speed can make or break your day. In some occasions, when the fishing is really slow, speeding up your approach will still get more fish in the boat. 2,5 – 4 mph is no exception on dead slow days, and you’ll need to burn it into your mind to do so, even tough it’s being told that when the water temperature on your fishfinder is 35F you should go slow. 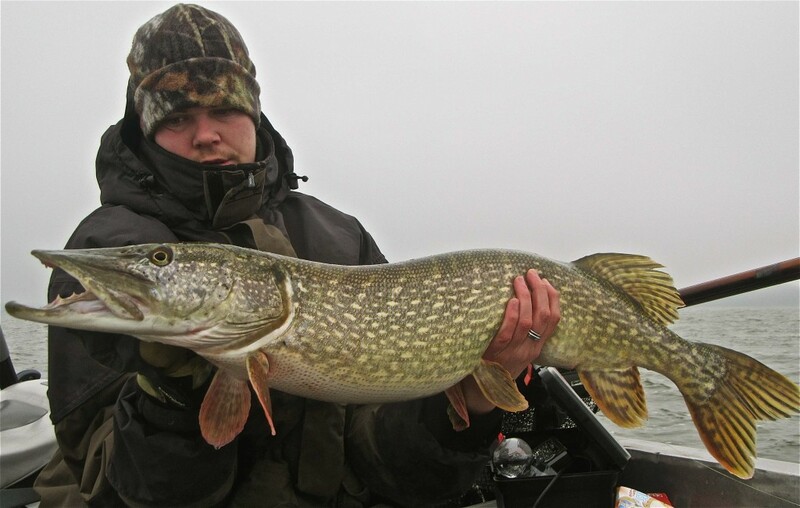 Sometimes Pike like a little speed and that can be the difference between a great day or a blank day. Li’l Ernie & friends for ice cold Winter Pike. In Winter, most of the trolling is done of the whole year. Cold Water means covering large amounts of water in order to find fish. Trolling is a perfect way to do so. 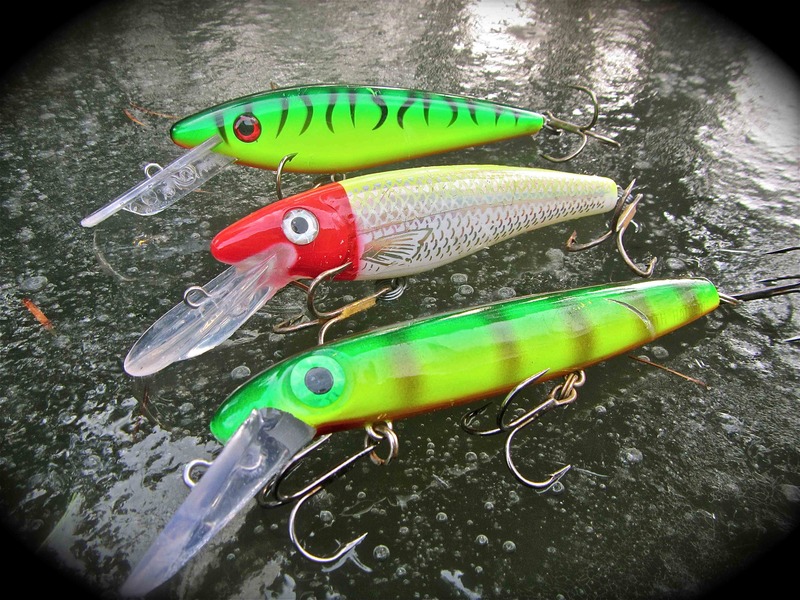 Deep diving crankbaits of 5 or max. 6 inches are perfect! Not only do they go deep, but also these little one’s have a great erratic action. And that’s exactly what you’ll need in this time of year. One note tough, only ”straight” crankbaits are used. Jointed ones will run out of line when trolled at higher speeds. The Grandma DeepDiver, Joe Bucher DepthRaider 6”, and Li’l Ernie will seal the deal! As shown in the picture above, mainly bright colours are used. In Winter, waters can be very turbid or stained all because the effect of the winds hauling across the water. If it’s not freezing in this time of year, there are often hard winds, and sometimes visibility underneath the surface is very poor. These colours stand out and don’t go unnoticed! Did you see the diving lips of all these crankbaits are kinda the same? That’s because they all do not run deeper than approximately 11ft, the magical depth for Pike this time of year! Why? When the days grow longer, so does the need for spawning. Even in waters with depths around 20ft, they can be found ”halfway”. And as the sun gets higher on the horizon by noon, it warms the upper layers of a water system. Baitfish get up higher in the water, and so does the Pike. So when your lure is in the middle of it all, you are within striking range and can’t go wrong! One thing thats a synonym to Winter is Ice. When everything is frozen, you can’t go out. A time where silence underneath the surface is present. A good thing! When waters are frozen up, it’s often a dark world below. Pike get a some rest from the anglers, and vice versa. A time to consider some things again and start with a fresh mind when waters are open again. The same goes for the Pike. Within their frozen world they remain silent. There are no winds to stir the water up. The visibility comes back again, stained waters become clear, turbid waters the same. All is stable again. No need to hunt… But when thaw comes in, and waters become open again, the chase is back on. Much clearer waters provide excellent hunting opportunities, and for some reason ”white” is the colour of the moment! In many American books, white is described as a great Spring colour too, and who knows what Pike may see in this appearence. But it’s certainly worthwhile to try! Mid-Winter Crankin’, it’s a great experience being out there to face the elements, and who knows what you might end up on the other side of your line! Ice out, and DepthRaider in!